SANTA FE, N.M. (AP) — Hispanic and Native American leaders in New Mexico locked in a dispute over the annual re-enactment of a 17th-century Spanish conquistador reclaiming Santa Fe - which has drawn comparisons to the Confederate monument debate - announced plans Wednesday aimed at "reconciliation." The All Pueblo Council of Governors, Archdiocese of Santa Fe, and Los Caballeros De Vargas said a new list of events will seek to ease centuries-old tensions around the myth of Santa Fe being reclaimed by Spanish settlers from Native Americans. 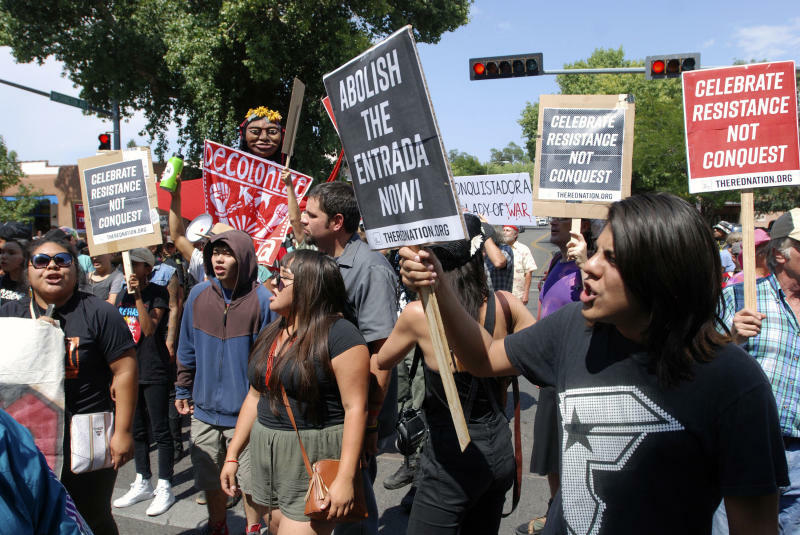 Organizers of the annual Fiesta de Santa Fe recently agreed to discontinue the "the Entrada" re-enactment and issued an apology to New Mexico's Pueblo Indians. Some Native American activists have criticized the re-enactment for years. They say it's a symbol of colonialism for Native Americans and glossed over New Mexico's bloody past by falsely claiming the reclaiming of Santa Fe came without violence. Hispanic organizers of the Entrada, whoever, had insisted that the re-enactment was a celebration of Spanish settlers who defied the odds and settled hostile territory but came to an understanding with Native Americans unlike Europeans in other parts of the present-day United States. Under the new plan, Santa Fe will play host to a monthlong celebration that will kick off with a Pregón de la Fiesta Catholic Mass and Po'Pay's Pueblo Dancers on Sept. 7. The celebration will end with Indigenous Peoples Day on Oct. 8. Santa Fe Mayor Alan Webber, who attended a year's worth of meetings between Hispanic organizers and tribal leaders, called the agreement historic and said it "celebrates reconciliation" after years of pain and misunderstanding. "The history of New Mexico is being recognized," Webber told The Associated Press. "This is about solidarity and forgiveness and taking a path to a different future." All Pueblo Council of Governors Chairman E. Paul Torres said leaders finally acknowledged to each other that the conflicts of the past haunted them and threatened to destroy them. "By our collective courage, we resolved ourselves to acknowledge the pain and the suffering inherent in first encounters," Torres said. "This was a time when we refused to accept the threats of division that could have destroyed the spirit of our beloved homelands." Historians have said the Entrada re-enactment lacked proper context about the events. Others called it revisionist history. The dramatization, for example, didn't mention the threat of force that de Vargas used to reconquer Santa Fe or the years of bloodshed and brutality that followed. Opposition to the Entrada dates to at least 1977, when the All Indian Pueblo Council formally expressed disapproval of the Fiesta de Santa Fe "for its offensive display depicted by the reenactment." Webber said Hispanic and Native American leaders will sign a new proclamation in September that outlines the agreement and understanding. The move comes amid a debate across the U.S. over removing statues of Confederates and the names of Confederate leaders from public roads and buildings. Some statues have been defaced or vandalized.